The Top 8 of that Invitational was played with the Legacy format, which led to my reputation as an Elves guy, but it was Domri Rade and company that did the heavy lifting for me during the Swiss rounds, where I finished 7-1 in Standard and only 5-3 in Legacy. Playing Domri Rade required a very high creature count so its +1 ability drew a card as often as possible and the -2 ability always had a solid body to throw around the battlefield, but it was a powerful enough to make the deckbuilding restriction worthwhile. One of the first tests of a planeswalker is whether or not it defends itself. At first glance it appears Domri, Chaos Bringer fails that test, since neither of its first two abilities affect the battlefield. But as we've learned with Karn, Scion of Urza, it's really hard to attack down a planeswalker that starts on five loyalty. If your opponent can cleanly attack with six power of creatures, something is going horribly wrong, so I wouldn't worry about Domri not being able to generate a token or clear away an attacker. Chances are you're going to be able to untap with it if you want to. Now, let's look at the abilities. 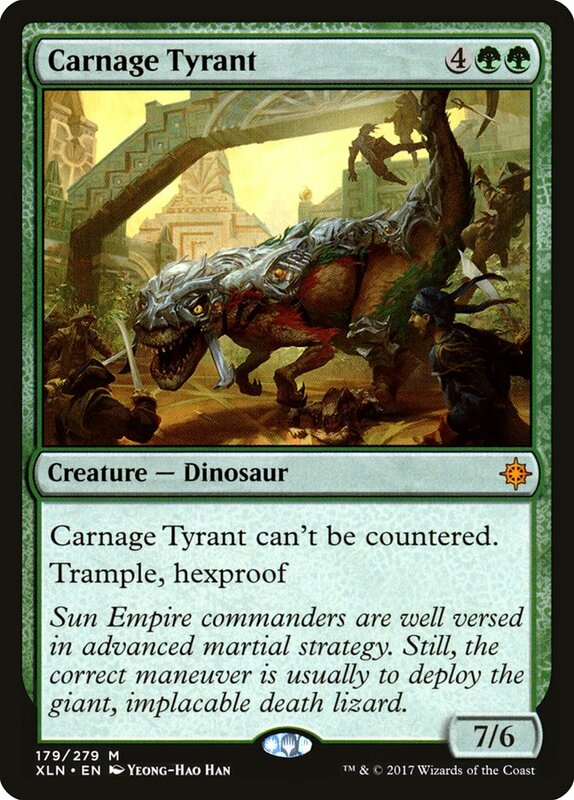 Domri Rade wanted to play with big creatures so as to maximize its fight ability. The affinity for bigguns hasn't changed with this latest iteration, but Domri, Chaos Bringer wants to help get those creatures into battle as quickly as possible by giving you the mana to cast them below curve and granting them riot to get the attacking started right away or prep them for combat with a more formidable enemy. As far as which big creatures to pair with Domri, there's one obvious answer. At four mana, Domri sets you up to untap, play a fifth land, add a mana with its +1, and cast a six-drop. Anyone, top of your head, know of a powerful six-mana creature in Gruul colors that wouldn't mind gaining riot? One of the bogeymen of Standard, Carnage Tyrant is the perfect pairing with Domri, Chaos Bringer. They fit on curve with each other, and Carnage Tyrant being nearly impossible to interact with outside of combat makes it a great card to build towards. The worst case scenario for Domri is to untap with it, slam a creature, and have all your hard work undone by a single removal or counter spell, but that's never going to happen with ole Carny T around running the ferris wheel. You can jam with the same reckless abandon that the Gruul clan has been known for for generations. 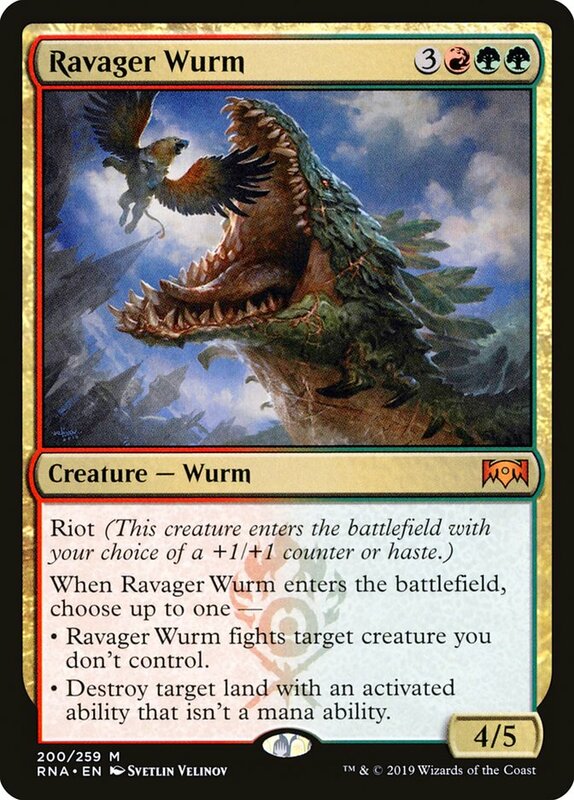 Another great pairing with Domri is Ravager Wurm. The deckbuilding restriction that Domri imposes makes it difficult to include a lot of interaction. Domri Rade overcame this with its -2 acting as much needed removal. Domri, Chaos Bringer doesn't have that luxury so finding creatures with built-in removal is important. This lets you not only answer key threats on the other side of the battlefield but also dig for them with the -3 ability. Ravager Wurm is great in this role since it fights well, and can even answer problematic lands when there's no creature to fight, most notably Azcanta, the Sunken Ruin. Oh, and if you ever destroy a land to take your opponent off of a key Settle the Wreckage then Magic law states that they have to retire. There's no coming back from that beating. Ravager Wurm looks even better when considered in the context of the current Standard format. 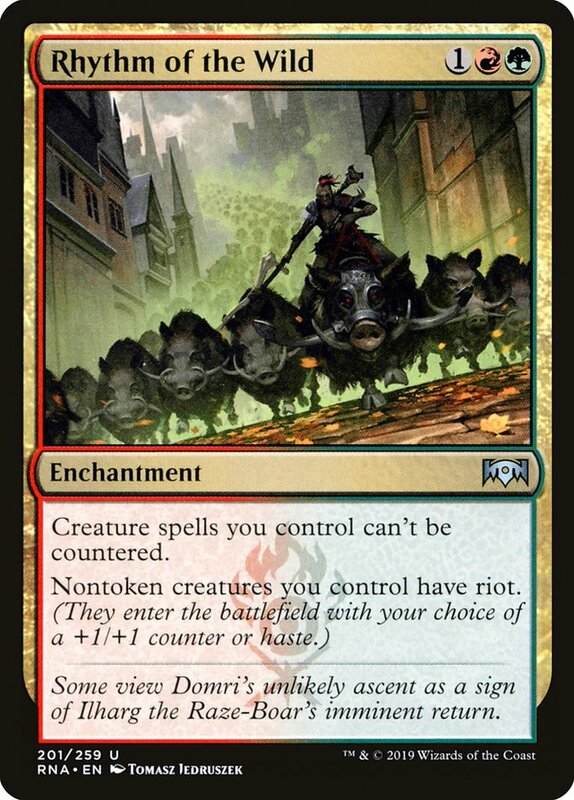 Multiple instances of riot on the same creature will act cumulatively, meaning you get to make the choice for each instance and gain multiple +1/+1 counters, or haste and a +1/+1 counter on a single creature. For Ravager Wurm, that second instance is going to be very important, because at 4/5, it's just small enough to get eaten by both Niv-Mizzet, Parun and Lyra Dawnbringer, so to fight these creatures you have to choose the +1/+1 counter over haste with riot. That's a choice you'll be happy to make, since answering your opponent's large creature while also casting one of your own is a significant tempo swing, but with Domri you get to have your cake and eat it too, giving Ravager Wurm haste in addition to +1/+1 to also get in a big attack or answer a planeswalker. Domri wants to play haymaker Magic, and Ravager Wurm is one heck of a haymaker. Next, consider Domri's -3 ability. Drawing multiple cards is quite rare for a single planeswalker activation, especially at four mana. In fact, it's only the second such instance in Magic's history, with the first being Jace, Architect of Thought, a card that was a staple for much of its time in Standard. And while Jace's -2 ability often brought you the two worst cards among the top three, Domri is often getting two of the best cards among the top four. Unfortunately, Domri doesn't have quite enough loyalty to use its -3 ability on consecutive turns like Jace could, but leaving itself on two loyalty is very important in a format containing Goblin Chainwhirler. Note: For those of you who want to check my work, I used 59 as a deck size to adjust for the fact that the Domri being activated is not in the deck. Further adjustments could be made to account for the lands used to cast Domri, but given the existence of mana creatures like Llanowar Elves I didn't feel comfortable doing so. In any case the differences are going to be quite small. So with a relatively high creature count, we can expect to draw somewhere between 1.5 and 1.75 cards from a single activation, while hitting two creatures more often than not. That's a pretty good haul if you have the battlefield presence to defend Domri from an attack, as it leaves you significantly ahead against a Vraska's Contempt or Conclave Tribunal. If you're concerned that the ability is overrated by these numbers because you're often going to hit low impact creatures like Llanowar Elves and the like, keep in mind that to consistently hit one significant creature, you'll want about fifteen of them, so even if half of the above creature counts are one- and two-drops, you're likely hitting something useful with additional value tacked on. 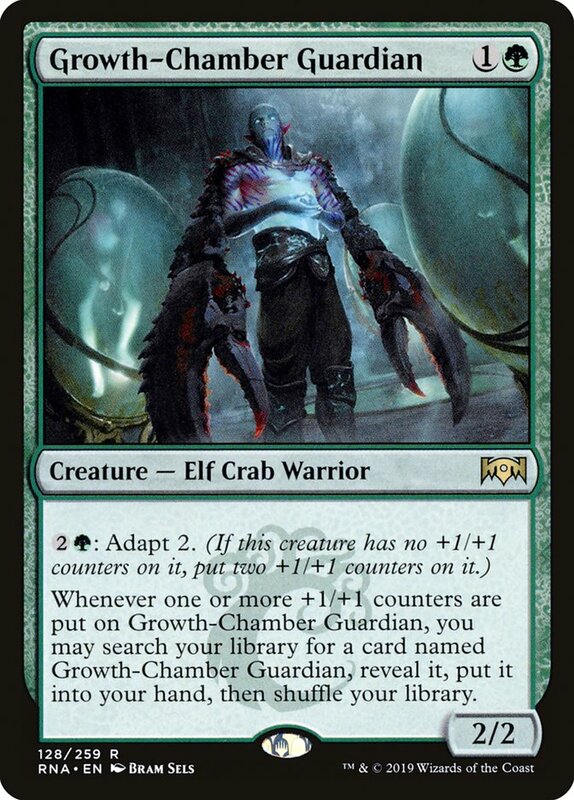 To help mitigate this issue, you should look to utilize cheap creatures that scale effectively into the late game. 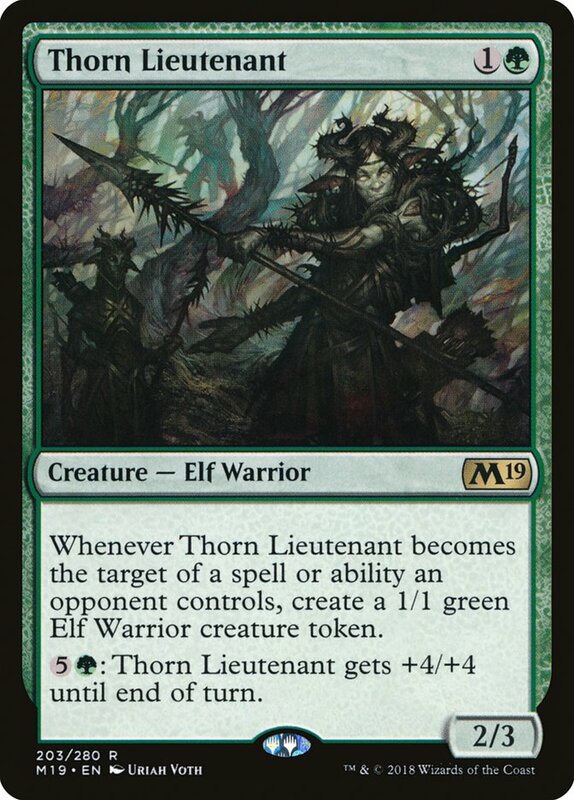 Thorn Lieutenant is a good example in the existing format, and from Ravnica Allegiance we're gaining Growth-Chamber Guardian, a powerful card in its own right that I'd be more than to find with Domri. Guardian synergizes nicely with riot from Domri's +1, since its ability triggers off of any +1/+1 counter, not just those granted via adapt, so with riot you can cast it as a 3/3 and immediately get another copy without investing any extra mana. 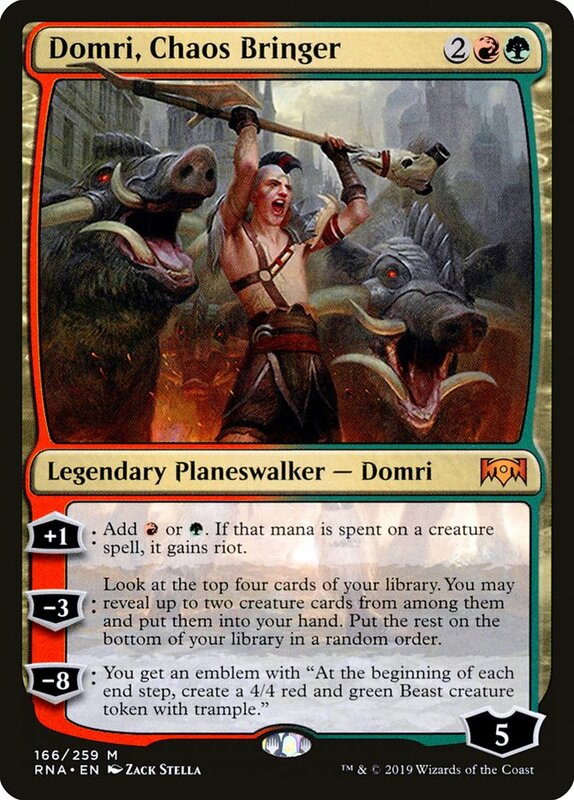 Moving on, like most planeswalkers, Domri has an ultimate, and like most planeswalkers, it's not particularly relevant. The one thing I look for is whether or not it's likely to be game-ending, and while creating a 4/4 token with trample every turn won't end the game immediately, it's going to be tough to beat for most decks. So even though Domri's +1 isn't gaining card advantage by itself, it does apply a clock of sorts to the opponent, forcing them to answer it or die. And lastly, when evaluating a planeswalker, I like to look at what the most common play pattern with the card will see, to both see if there's a natural progression in its abilities and then build towards that progression. I noted earlier that Domri, Chaos Bringer can't use its -3 ability twice in a row like Jace, Architect of Thought, but that's not a significant issue since once you use its ability once, you should have a hand with several good cards to cast. At that point Domri's +1 ability allows you to quickly deploy those extra cards while also setting up for another -3 to reload and keep up the pressure. This deck is largely inspired by the list shown in the beginning of this article, though there isn't a secondary mana creature on the power level of Gyre Sage, so I've opted for a less ramp-oriented and more beatdown-oriented approach. The presence of both Gruul Spellbreaker and Rhythm of the Wild, among the more powerful Gruul cards previewed thus far, support that shift in focus while providing excellent three-drops to pair with Llanowar Elves. At 29 creatures this list is in the middle of my desired range, though utilizing Rhythm of the Wild, a non-removal spell in the previous non-creature slots is a significant cost. Because of that I went fully with Ravager Wurm in the maindeck and Carnage Tyrant in the sideboard for control, a swap that is helped out by Rhythm already providing protection from counterspells. 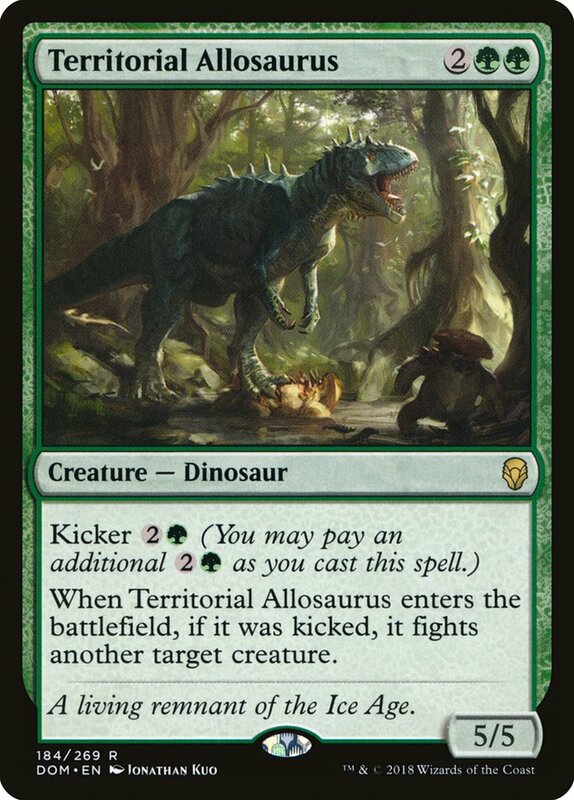 I also included three copies of Territorial Allosaurus for additional removal, though we're relying heavily on early blockers to stem the bleeding against aggressive decks. 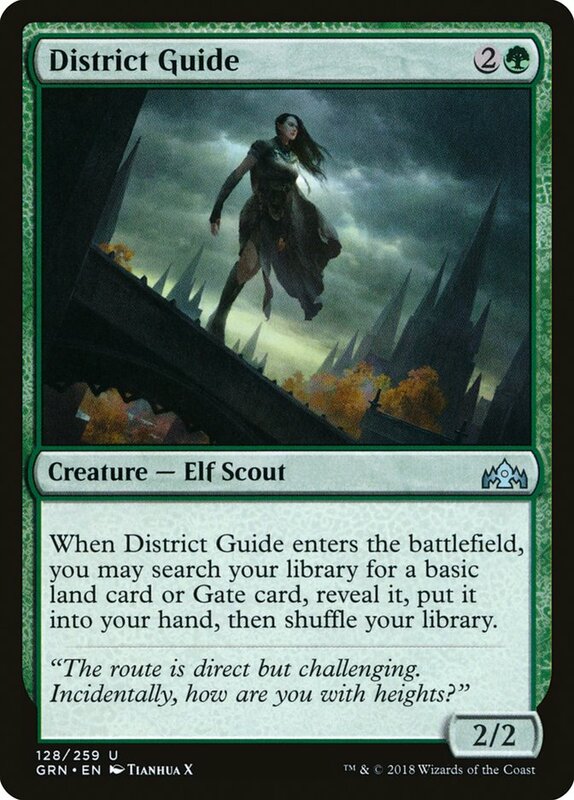 District Guide is the card that ties the whole room together, much like Borderland Ranger did for me in 2013. This deck doesn't have a lot of acceleration, so it needs to hit its land drops to cast spells on time, and at only 24 lands to keep the creature count high, you're going to need some help. Jadelight Ranger has been the main player in that role in Standard, but that's in large part due to its synergy with Wildgrowth Walker. We're not interested in a full explore package here, so the simplicity and consistency of District Guide wins out. With all the mana sinks in this deck I could see a 25th land, but I'm erring on the greedy side to maximize the potential of Domri. 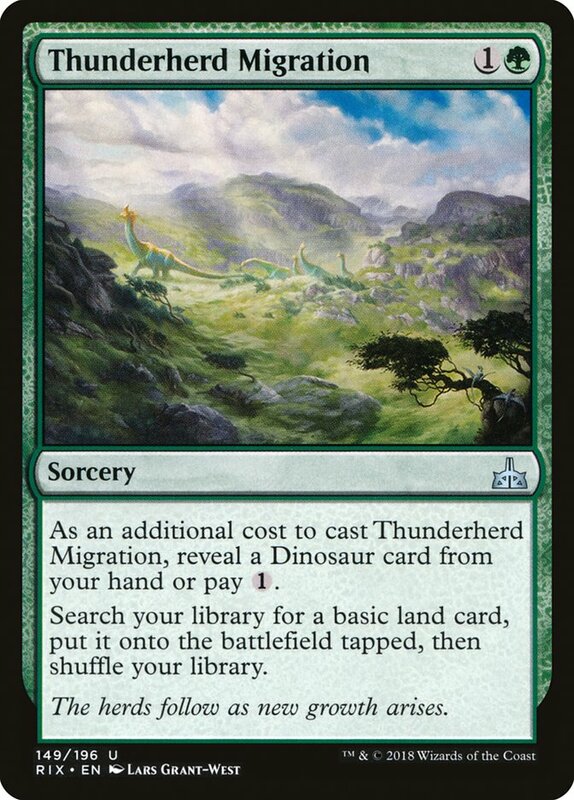 Thunderherd Migration is a card I've had my eye on for a while now since Rampant Growth has been correctly deemed to be too good for Standard. It would make a perfect secondary ramp card next to Llanowar Elves to power out both Domri and the big creatures he allies himself with, so I started from the goal toward maximizing it. Thrashing Brontodon, Regisaur Alpha, and Carnage Tyrant form a solid shell of Dinosaurs to build around, but it's just a touch short of fully enabling the ramp spell. The issue from here is that many of the other good Dinosaurs are expensive, and you can't raise your curve too high, but Domri helps to cast those more expensive creatures. 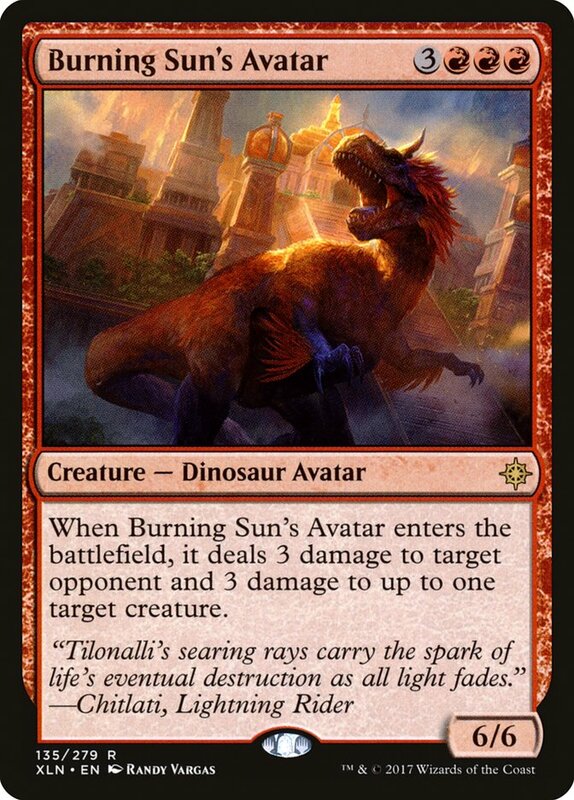 I like Burning Sun's Avatar as another source of removal and a great creature to grant haste with riot and Deathgorge Scavenger, which can stave off aggressive decks early and turn a race around rather quickly when granted haste since you can gain four life in one turn. One of the other issues with enabling a card like Domri that requires a high creature count is sideboarding. Sideboards tend to be filled with narrow answers for specific problems, and that means they are rather spell-heavy. This means post-sideboard configurations naturally make Domri less effective, and it's those slower games where its -3 is going to be most necessary. Therefore we want to find creatures that can serve similar roles. 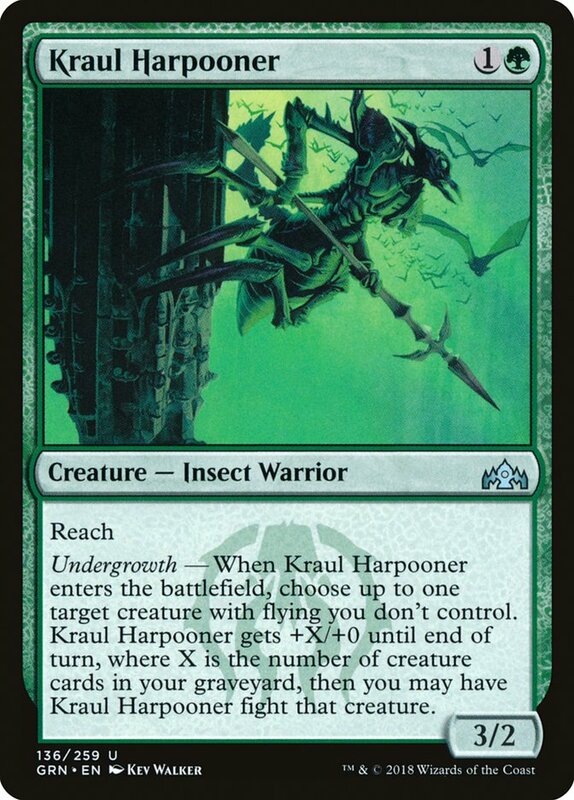 Kraul Harpooner is great for answering various Drakes, Niv-Mizzet, Parun, and Lyra Dawnbringer, where Raptor Hatchling is the perfect speed bump against aggressive decks, often threatening to trade for a creature and leave a 3/3 body behind. 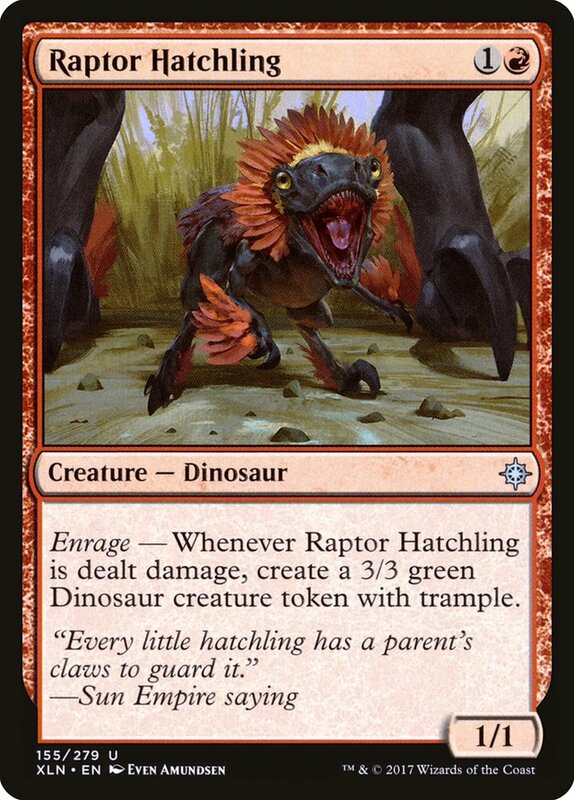 In this list it's particularly important because you'll want to cut down on several of the high end Dinosaurs in this matchup, so Raptor Hatchling keeps your Dinosaur count high enough for Thunderherd Migration. I suspect you'll often want to sequence the Raptor Hatchling first and follow it up with a full cost ramp spell, but it's still important to have the option to play in either order. As a four-mana planeswalker that doesn't affect the battlefield, there's some worry that Domri, Chaos Bringer won't live up to the legacy of its cheaper predecessor. After all, Karn, Scion of Urza received plenty of hype during Dominaria preview season only to be relegated to role player status as the format took shape, and it didn't require nearly the deckbuilding commitment. That said, the ability to draw multiple spells immediately is more powerful than anything Karn does, and immediate return is king in Magic. I don't think the new iteration is quite as powerful as the original, but it's a more than worthy successor to lead the Gruul clan.